What Are Blessed Thistle & Milk Thistle? The chicory plant is indigenous to Europe, India and Egypt and was introduced to the United States in the late 19th century. The dandelion plant grows wild in most parts of the world and is cultivated in France and Germany. The roots of both plants purportedly have therapeutic properties. Seek the advice of your doctor before you use any botanical herbs. Native Americans used dandelion root infusions to treat stomach problems, kidney disease, heartburn, swelling and skin problems. In Europe, dandelion root was incorporated into remedies for boils, eye problems, fever and diarrhea. Chicory was cultivated in Egypt as a medicinal herb about 5,000 years ago. Early European herbalists believed chicory had a stimulating effect on the liver. Chicory root was used as a coffee substitute and additive in Europe in the 19th century. The dandelion plant is rich in vitamins and minerals. It contains beta-carotene, thiamine, riboflavin, and vitamins C and D. Minerals include potassium, iron, calcium, magnesium, phosphorus and sodium. Dandelion also contains fiber, and linoleic and linolenic fatty acids. Chicory does not contain as wide a variety of nutrients. Chicory contains the fiber inulin, carbohydrates and flavonoids. When roasted, inulin provides a coffee-like aroma. Tea made from dandelion root can be used as a diuretic, to aid liver and gallbladder function, to regulate blood sugar and to stimulate appetite, according to the University of Maryland Medical Center. Chicory can also be used as an appetite stimulant. Oligosaccharides in chicory have probiotic properties and help maintain beneficial bacteria in the gastrointestinal tract. 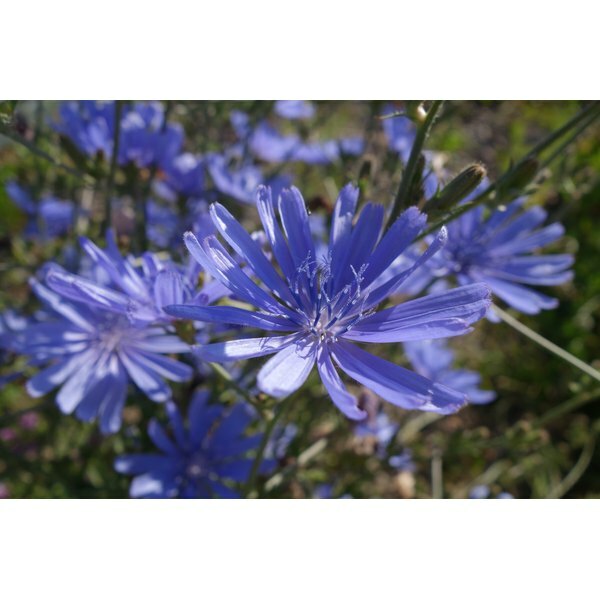 The presence of the fiber inulin may help chicory treat constipation, diarrhea and cardiovascular disease, notes Drugs.com. Dandelion and chicory roots can both be used as coffee substitutes. Dandelion has not been evaluated by the FDA for purity or effectiveness, nor are there any regulated manufacturing standards. According to Drugs.com, some dandelion supplements have been found to be contaminated by heavy metals and other drugs. Do not take dandelion if you have gallbladder problems, are diabetic, or taking diuretics or blood thinners such as warfarin. Chicory is classified as safe by the FDA. However, Drugs.com suggest you avoid chicory if pregnant, breast feeding or if suffering from gallstones. What Are Dandelion & Burdock? Is Dandelion Root Tea a Diuretic?